The Epson L130 Inkjet Printer can print photos or documents up to a maximum resolution of 5760 x 1440 dpi. It comes with an integrated ink tank that ensures a hassle free use. 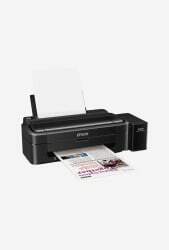 In addition, this inkjet printer features a compact design that sits comfortably on your office desks and table tops.